Provide comfort for the family of Chris Sherrerd with a meaningful gesture of sympathy. 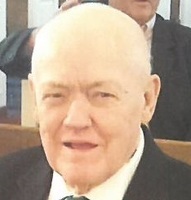 Chris S. Sherrerd, 89, of Shippensburg, departed this life on the morning of Saturday, January 12, 2019, at Brookview Menno Haven, Chambersburg. He was born on June 16, 1929, in Clinton, NJ, a son of the late John and Gertrude Sherrerd and married Sarada P. Haines on November 12, 2005, in Elizabethville, PA.
Chris worked as an engineer in the technology industry. He was a member of Restored Life Ministries, Shippensburg. In addition to his wife of thirteen years, Sarada, Chris is survived by two daughters, Christie (Anthony) Gehman of Lititz and Mary Beth (Edward) Lewis of Michigan; a step-daughter, Karen (Virgil) Geidel of Boiling Springs; step-son, Max L. Gibney, Jr. of Carlisle; six grandchildren; four step-grandchildren; seven step-great grandchildren; and several cousins. In addition to his parents, Chris was preceded in death by his first wife, Dorothy Jane Apgar, who died on January 19, 2001, and two brothers, Jack and Morris Sherrerd. His graveside funeral service will be held at 11:00 a.m., on Wednesday, January 16, 2019, in the Spring Hill Cemetery, Shippensburg. Mr. Thom Gardner will officiate. There will be no public viewing or visitation. A celebration of Chris’ life will be held at 11:00 a.m., on Saturday, February 9, 2019, at the Celebration Community Church at 1048 South Mountain Road Dillsburg, PA 17019. The Fogelsanger-Bricker Funeral Home & Crematorium, Inc., Shippensburg, has been entrusted with his funeral arrangements. Online condolences may be expressed at www.fogelsanger-brickerfuneralhome.com. Consider providing a gift of comfort for the family of Chris Sherrerd by sending flowers. Mary Beth and Christie, I remember your dad as such a gentleman, and a godly man. He impressed me as a child with his calm, steady presence, prayers at mealtimes, and attention and devotion to your mom and you. There is joy in the promise of Heaven, but I'm sure you will very much miss him here on earth. You have my deepest sympathy for the passing of this good, great man. My condolences to the family. May God provide you comfort and strength during this difficult time. 2 Corinthians 1:3, 4.